On June 3, 2015, Drs. 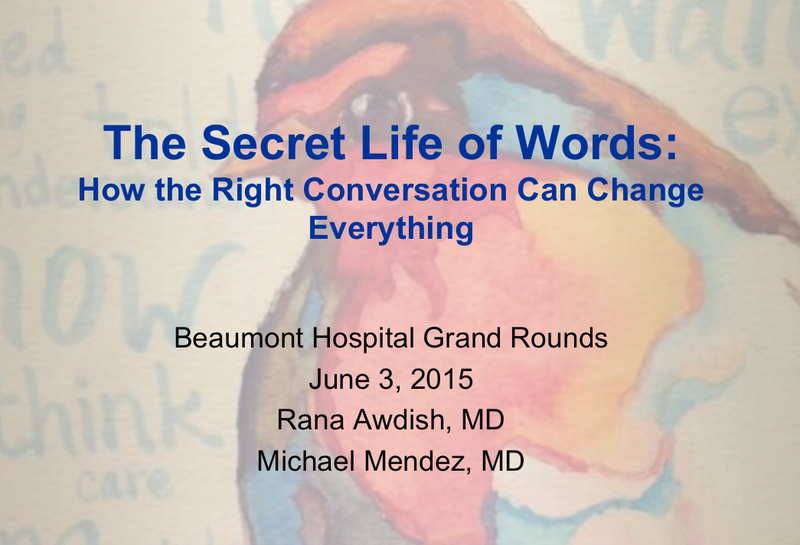 Rana Awdish and Michael Mendez presented “The Secret Life of Words: How the Right Conversations Can Change Everything,” at Royal Oak Beaumont’s Internal Medicine Grand Rounds. They discussed caregiver’s biases and barriers to effective communication and how simple communication toolkits can provide powerful frameworks for better communication with patient’s and their surrogates. They also talked about how communication skills can be taught and how better communication can lead to less physician burnout. Data from a recently completed Pilot at HFH MICU was also presented showing how the training and learning can be embedded into the ICU process.